A hard workout. Resilience means you can recover from it and bounce back stronger (or at the very least, not weaker). A long day at work. Resilience means you can power through, get a good night’s sleep, and come back the next day without feeling wrecked for the whole week. A family crisis. Resilience means you can bear up under a long drive in the middle of the night, an unexpected sleepless night at the hospital, or a series of tense phone calls. Obviously these things aren’t doing your health any favors, but if you’re resilient, they won’t crush you. You can handle them. An airport disaster. Resilience means that even if your flight is canceled and you have to wait overnight in the airport because there aren’t any hotels, you can make the best of whatever food you can round up, stay calm, get what sleep you can, and keep plugging along until you get home. Again, eating three mini-bags of airport trail mix for dinner and sleeping on your carry-on probably isn’t your body’s preferred modus operandi, but you can handle it for one night. If you’re a video game fan, think of building resilience like collecting hit points. The more resilient you are, the more damage you can take before you break down. Real life is an unpredictable and occasionally dangerous game; you want all the hit points you can get. You might think these things have nothing to do with Paleo – how is food going to help you through a night in the airport? But actually, this is one big way that Paleo can improve your life: by helping you build the resilience you need to tackle these kinds of challenges. “Resilience” is both mental and physical, and it’s silly to try to separate the two. Having a strong body gives you more mental energy, and makes it easier to think clearly, even if you don’t have to face any physical challenges (as you very well might). So here’s how to use Paleo to build up your resilience – mostly from a physical perspective, but in ways that cross over into the mental. The “one step backward, two steps forward” model, where you recover and overcompensate. For example, exercise initially makes you sore and tired, but in the long run, regular exercise gives you more energy. If you want the science behind this, check out this explanation of hormesis. The “slow steps forward” model. Getting good sleep is an example of this. You’re not going back and then forward; you’re just slowly building up your strength and energy. Here’s a simple test to see whether Paleo is really helping you build resilient strength: if you’re strong and resilient, you move spontaneously. Sometimes, you dance around the kitchen while you’re cooking because your favorite song is on and you can. Sometimes you go for a walk because it’s a nice day outside and you just want to enjoy the evening. You may not always be totally raring to go to the gym or head out for a run, but it’s not a constant battle every single day just to haul your aching and exhausted body off the couch. Moving spontaneously is a sign of energy, mental and physical. If you have that extra energy, it’s a reasonably decent sign that whatever your diet/workout/recovery/stress management routine is, the energy you invest in it is coming back with interest, and giving you spare energy for all kinds of other challenges. 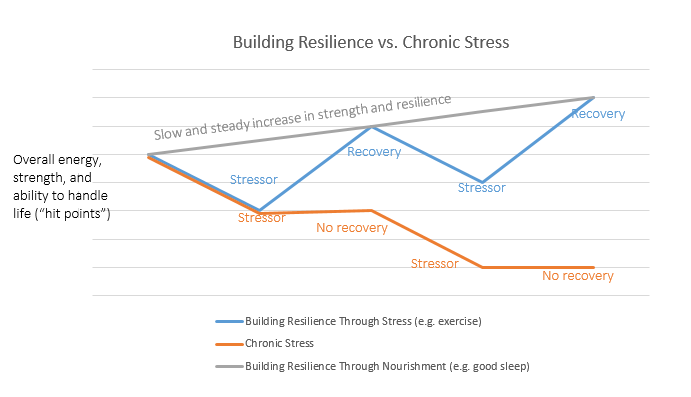 If you’re so run-down from chronic calorie restriction and/or over-exercising that every form of movement is a chore, you never move unless you have to, and your workouts leave you so exhausted that all you want to do the rest of the day is sit down, you’re not building resilience. You’re just overtraining and beating yourself down – and making yourself vulnerable to any other stressor that might come along. The same is true of beating yourself into the ground by any other means (a long string of late nights, a chronic pattern of horrible days in the office…pick your poison). The “move spontaneously” test isn’t perfect, but it’s a reasonably good way to get started. Seek out the good stress. Hormetic stress is stress that makes you stronger once you recover from it. The classic example is exercise. Progressively challenge yourself with your workouts, but only within the limits of your ability to recover. It bears repeating: a workout that you don’t recover from does you absolutely no good. It doesn’t make you stronger, or faster, or healthier. There is such a thing as planned overreaching, which is a deliberately-designed period of under-recovery, but it’s something that professional athletes use under the guidance of a coach: unless you fall into that category, don’t do it. Seek out unpredictable challenges, again, within your ability to recover. A heavy squat is a challenge, but it’s a predictable one. You know it’s coming. You can decide whether you’re up to it or not. But life isn’t like that – if you want to “train” for life, you need to learn to handle unpredictable challenges. Go somewhere new. Do something you’ve never done. Hike a new trail; explore a different part of town. Nourish yourself and avoid stressors that just tear you down. Even hormetic stress can tear you down if you can’t recover from it. And some stressors aren’t hormetic at all – like chronic sleep deprivation. There’s just nothing useful about it. 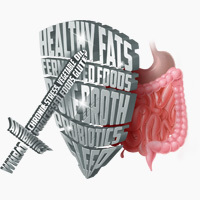 Eat nourishing food, and eat enough of it. Food can either help prepare you for stressors (by providing nutrients that your body needs), or it can be a stressor (if you aren’t getting enough, or if you’re getting enough calories but not enough nutrients). Starving yourself is not the way to get stronger. Even if you want to lose weight, be gentle with your body; you don’t have to get extreme with the 1200 calorie diets to make it happen. Sleep. It’s valuable to be able to stay up all night when you need to, in extreme emergencies – and sometimes those emergencies do happen. But you’ll do much better in a crisis if you have a background of consistently solid sleep. Consistently getting enough food and sleep builds up your strength, so you’ll have it ready to go when you really need it. Resilience is a kind of strength, but it’s not about how much you can deadlift. It’s about how much life you can handle. You can build up your resilience with good sleep, good food, and stressors that you can recover from. A good test for whether it’s actually working that way is spontaneous movement: if you enjoy moving your body and do it willingly, you probably have energy to spare. Paleo should help you build your resilience and give you a stockpile of energy that you can use as “hit points” when life gets tough. This is the way that it really goes beyond a “diet” for weight loss, and turns into a way of eating that improves your whole life.